The REACH Ambler project produced a number of materials that can be easily re-purposed for middle school, high school, and university classrooms. All included materials have been approved for classroom use by the Science History Institute, Act II Playhouse, and interviewees. Before examining these resources, we recommend looking over the REACH Ambler map, booklet, and Distillations article to familiarize yourself with the project. Teachers! Have you used these materials in an interesting way? Interested in sharing your methods? Email us, and we will add your guidelines, curricula, and classroom activities to our growing collection of teacher resources. Transcripts are available to teachers at no cost. Click here to view more information about each interview. Exhibit banners are available to teachers at no cost. 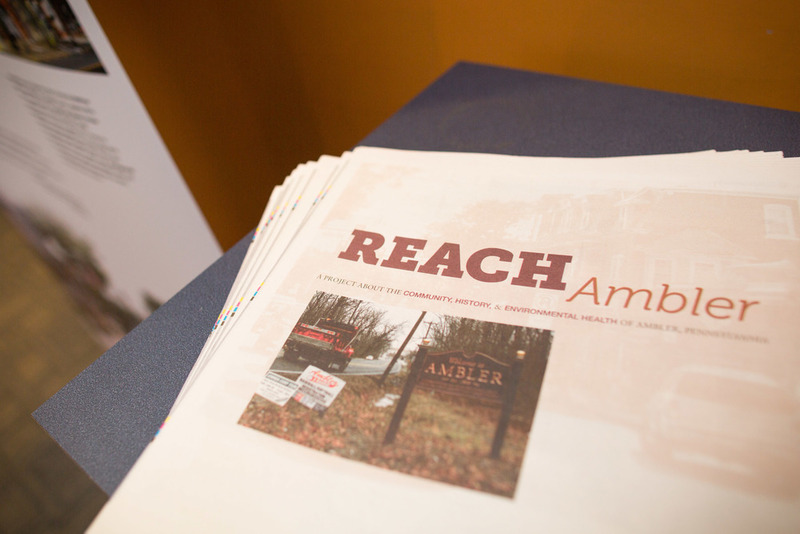 I would like to bring the REACH Ambler exhibit banners to my classroom or organization. Do you have questions or comments for us? Include them here as part of your request. Thank you! We will get back to you as soon as we can with additional information. If you have any questions, please contact Zack Biro at zbiro@chemheritage.org. 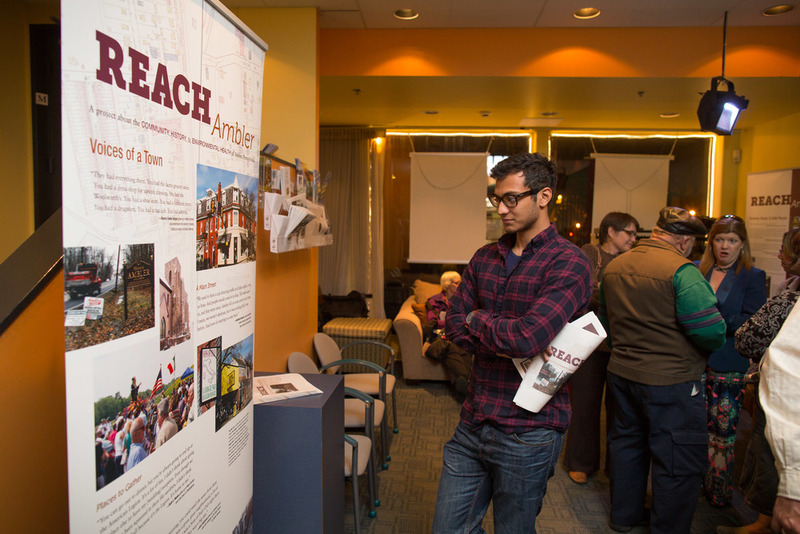 Consisting of three exhibit banners, Voices of Ambler explores the community, history, and environmental health of Ambler as understood by residents past and present. These 6 feet by 3 feet banners (see photos below) are portable and can be loaned to libraries, schools, and other community organizations in the greater Philadelphia area at no cost. Voices of Ambler originally appeared at Act II Playhouse in Ambler during April and May, 2015. April 25, 2015, Act II Playhouse. Photos by Conrad Erb. As part of REACH Ambler, 11 playwrights came together under the direction of Bill D'Agostino at Ambler's Act II Playhouse, developing 12 short plays based on oral history interviews. 7 of these plays were performed on April 25, 2015 as The White Mountains. Each play interprets Ambler's story in a very different way. Some are comedic, other serious; some focus on asbestos and civic activism, others on race and class, others on Ambler's manufacturing history. Most of the plays have only 2-3 characters, require few special props or costumes, and can be performed in less than 10 minutes. The REACH Ambler plays are available to be shared, discussed, and performed in school classrooms. The The White Mountains were performed again on April 6, 2018 and you can watch that performance using the video playlist below. Voices of Ambler’s accompanying 16-page booklet expands upon the stories told in the exhibit, sharing community perspectives on Ambler's history, contemporary debates, and hopes for the future. It can be used in classrooms in conjunction with the exhibit banners, or independently, and is available for viewing and download. REACH Ambler conducted 21 oral history interviews with Ambler-area residents, local officials, scientists, and activists. Full transcripts of these interviews are available for use in middle school, high school, and university classrooms, free of charge. Most transcripts are 30-40 pages in length. For more information about the transcripts, please see the Science History Institute. Select video and audio clips from the REACH Ambler oral histories can be viewed here. These excerpts cover a variety of topics, including community history, civic activism, environment, and health. Most are less than three minutes in length. Click on a category below to view video clips sorted by subject. Oral history excerpts focused on the history of the Ambler area, childhood memories, and community change. Salavatore Boccuti talks about changes in Ambler in the 1960s and 1970s. Salvatore Boccuti shares memories of the St. Francis Day Festival. Jack Delconte shares memories of South Ambler during his childhood. Carol DiPietro talks about growing up in Ambler. Carol DiPietro describes her mother's experience working as a secretary for Keasbey and Mattison. Bernadette Dougherty explains the rise of Keasbey and Mattison. Tim Hughes talks about his brother's experiences while working at the Ambler Pipe Plant. Beth Pilling talks about the negative perceptions she had of Ambler as a child. Victor Romano describes the workers' housing built in Ambler by the Keasbey & Mattison asbestos manufacturing company. Victor Romano describes growing up in a mixed African-American and Italian-American neighborhood in Ambler in the 1930s. Victor Romano describes the history of the Ambler reservoir. Victor Romano describes playing on the Ambler asbestos piles as a child. Victor Romano talks about the trolley that once came through Ambler. Ruth E. Weeks talks about the West Ambler playground. Ruth E. Weeks recalls the demolition of 70 homes on "Back Street" (West Chestnut Street) in Ambler. Ruth E. Weeks describes how the local American Legion hall was the social hub of of Ambler's African-American community. Flo Wise describes the West Ambler community's loss of Whitpain Park. Flo Wise describes the housing on "Back Street" in Ambler, and its proximity to the asbestos piles. Sharon Cooke Vargas describes how growing up in a relatively integrated Ambler insulated people her age from racial strife. Sharon Cooke Vargas tells the story of Richard Mattison and his mansion, Lindenwold. Oral history excerpts focused on recent activism and community change in Ambler, including the 2004 high rise protest, the formation of the Community Advisory Group for the EPA, and West Ambler community development. Robert Adams discusses the founding of Citizens for a Better Ambler. Rob Cardillo talks about his involvement in Ambler’s [date] high rise protest. Gordon Chase discusses debate surrounding the future of the Wissahickon Waterfowl Preserve. Helen DuTeau describes debates that happen during the Community Advisory Group meetings. Tim Hughes talks about his involvement with Ambler’s 2004 high rise protest. Beth Pilling describes the sometimes-heated debate that occurs at Community Advisory Group meetings. Gioia Smith describes the activism of her aunt, Billie Jean Thompson, who alerted local officials to asbestos exposure in a local park. Ruth E. Weeks describes the legacy of asbestos contamination on the built environment in the West Ambler neighborhood. Flo Wise describes the changing dynamics of Ambler's environmental justice Community Advisory Group. Flo Wise describes the many changes that West Ambler has undergone over the past few decades. Sharon Cooke Vargas describes the SEPTA train station, including her memories of it as a teenager. Oral history exceprts about Ambler’s natural environment and related issues, including management of the Wissahickon Creek and EPA cleanup. Bernadette Dougherty talks about the future of the Wissahickon Waterfowl Preserve. Jim Feeney explains his role as the EPA’s Remedial Project Manager for the Ambler Asbestos Piles Superfund site in the 1990s. Sharon McCormick describes pollution in Wissahickon Creek. Anne McDonough describes exploring Wissahickon Creek with her family. John Zaharchuck describes the redevelopment of the Ambler Boiler House into modern office spaces. Oral history clips describing health concerns and solutions relating to the presence of asbestos in Ambler. Bernadette Dougherty reflects on the health effects of the Bo Rit Superfund site. Sharon McCormick describes her concerns about the safety of the Bo Rit site. Eduardo Rovira describes what he thinks is the safest option for the Bo Rit Superfund site. Gioia Smith describes the pollution from the Ambler asbestos piles that she observed as a child and young adult. Flo Wise explains why asbestos removal would be detrimental to West Ambler, and expresses the community's need for a public park. One of the best ways to use oral histories in the classroom is to have students conduct interviews themselves. The Oral History Association, Oral History in the Mid-Atlantic Region, and other professional organizations have created a number of guides to developing oral history projects for middle school, high school, and university classrooms. Here are some of our favorites. For additional resources, see Oral History in the Mid Atlantic Region Bibliography and Oral History in the Classroom from the Oral History Association. A number of local social and governmental organizations have collected data related to environmental, heath, and medicine in Ambler. These resources pair well with the stories collected and shared within the REACH Ambler project. Here are a few places to find scientific information that relates to REACH Ambler.